February 22, 2017 – Martin Engineering, one of the world’s leading companies in the field of conveyor technology, has announced its acquisition of the German company CleanScrape GmbH. Less than a year afterMartin Engineering took over the exclusive distribution of the award-winning belt scraper, both company owners agreed to the sale. CleanScrape GmbH was founded in 2014 to supply and further develop conveyor belt cleaning technology. The business emerged from the company IBS Industrial Machinery Mining Service GmbH (Industriemaschinen-Bergbau-Service GmbH), which has been active for more than 30 years in mining, tunnel construction and conveyor technology. IBS and CleanScrape are a part of the Schmittgruppe, a fourth-generation, family-run business with headquarters in the northern Bavarian town of Bischofsheim an der Rhön. “CleanScrape GmbH will continue existing as a separate company, with all of the jobs and existing senior management remaining in place,” explained Michael Hengl, Managing Director of Martin Engineering Europe. CleanScrape GmbH will be an integral part of the Martin Engineering family in the future, and integration of IT structures and management has been completed. “With the acquisition of CleanScrape GmbH we have received a great product and a highly skilled and motivated team,” Hengl continued. When Martin Engineering became the sole distributor for the CleanScrape cleaner in 2015, distribution was initially handled by the company’s European headquarters, based in Germany. Customer interest was so great that Martin business units in other parts of the world also began selling the cleaner to conveyor operations in the USA, South America and Asia. The innovative belt cleaning system received the Australian Bulk Handling Award in the “Innovative Technology” category in 2013 for its design and potential benefits, which include low belt wear, extended service life, reduced maintenance and improved safety, ultimately delivering lower cost of ownership. It has been proving itself in a wide range of applications, such as mining, coal handling, quarrying, cement, scrap and other material bulk handling operations. CleanScrape is a primary cleaner which is installed directly below the discharge point. Unlike conventional belt cleaners that are mounted at a 90 degree angle to the belt, the CleanScrape Cleaner is installed diagonally across the discharge pulley, forming a three-dimensional curve beneath the discharge area that conforms to the pulley. The design incorporates a matrix of tungsten carbide scrapers and is tensioned lightly against the belt to prevent damage to the belt or splices. Despite extremely low contact pressure between belt and cleaner, it has been shown to remove as much as 95% of potential carryback material. 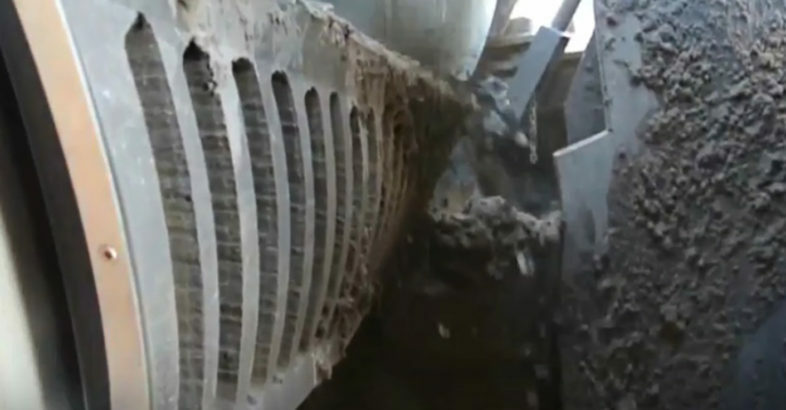 The novel approach has been so effective that in many operations, previously crucial secondary belt cleaners have become unnecessary, saving further on belt cleaning costs and maintenance time. Key features of the innovative scraper are the extremely low surface pressure, low wear on the belt and virtually no maintenance. The low contact pressure of the unique design helps reduce wear and damage to the belt, ideal for both slow and fast conveyor belts, including those with mechanical splices. The small footprint is often a perfect solution for confined spaces, and it can be located either inside or outside of the transfer chute. Installation is straightforward, typically requiring less than two hours to complete, even for inexperienced personnel. CleanScrape Cleaners are generally sold in three sizes: S, M, and L, which cover drum diameters from 270 mm to 1250 mm (10.6″ to 49.2″) and belt widths from 300 mm to 2800 mm (11.8″ to 110.2″). Each size is available in four different carbide metal grades to suit specific materials and belt structures, one of which is a carbide formulation developed for use on mechanically spliced belts. The supporting components of the assembly can be specified in regular steel or in stainless for specialized applications. All of the CleanScrape Cleaner designs are certified by ATEX and can be used in underground mining. Necessary equipment and accessories, such as chains or steel cables, can also be obtained from Martin Engineering by the meter.